Clean hands can be oh-so-soft too. 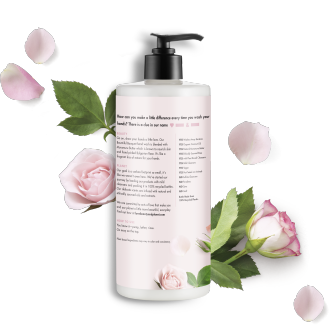 Why not care for them with our beautiful hand wash blended with Murumuru Butter and handpicked Bulgarian Rose. It’s like a fragrant kiss of nature for your hands. This hand wash is also 94% Naturally Derived and cruelty-free, paraben-free, sulfate-free, dye-free, & formulated without phthalates. Read our Naturally Derived Page to find out more. Go on, show your hands a little love. 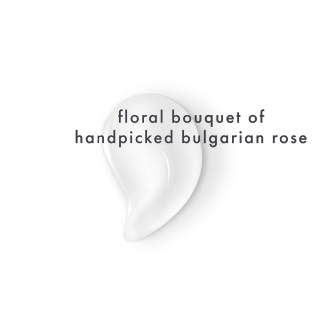 This bountiful bouquet of a hand wash is blended with Murumuru Butter, which is known to nourish skin, and richly floral, hand-picked Bulgarian Rose. Whether you’re looking for a fragrant hand wash for the kitchen, or a luxuriously scented hand wash for the guest bathroom, this one leaves hands feeling pampered and nourished. • Pump, lather, rinse. It’s easy to use. Just ensure you go easy on the tap. Together, we’ll save a whole lot of water, while staying deliciously scented, of course. 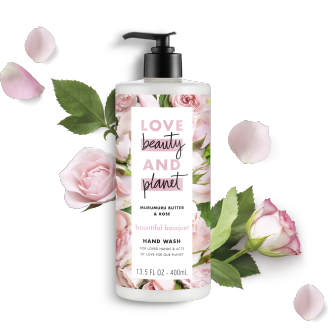 Love Beauty and Planet® Bountiful Bouquet Hand Wash, infused with Murumuru Butter, works to clean and soothe your hands, with an added a kiss of indulgent Bulgarian Rose. murumuru butter & rose liquid hand wash is rated 4.6 out of 5 by 154. Rated 3 out of 5 by rbleam from I received the Love Beauty And Planet Murumuru Butter & Rose hand cream free in exchange for my review! I have tried this product before in a different scent and I was pretty excited when it arrived to try the Rose. Not only is it paraben free and vegan, but the smell is so floral and fresh. The hand cream fragrance is very strong and stays on your skin for awhile, but I like it that way. And for someone who doesnt wear perfume often, its nice to have a fragrance that remains on your skin for awhile. During the cold winters of the Northeast, I will definitely be carrying this product around in my purse as a nice luxurious treat for my hands! Rated 5 out of 5 by analisasmommy050511 from I WAS NOT COMPENSATED FOR THIS POST; HOWEVER, I AM CREATING THIS POST AS PART OF A CONTEST and I did receive this product complimentary from Influenster in exchange for my honest review: I received a very large bottle of wonderfully scented floral/rose hand was and I absolutely love this hand wash! The scent is perfect not too light and not too strong as to overwhelm you and cause a headache! It gets nice and sudsy which makes your hands actually feel clean. I also have very sensitive dry cracked hands and since I have began using this it has began to resolve and heal. I would definitely recommend this product to friends and family. Rated 5 out of 5 by anitajaynyc from I got this in an influenster vox box and its been in my bathroom since. Its only been two days but when I tell you it smells so great and leaves your hands feeling supple it really does. I enjoyed it so much but also my guest have as well. We just had a get together this morning and every guest loved LOVED the hand wash! I got so many compliments of the scent as well as the design of the bottle. It matches our rose & light beige scheme unintentionally and honestly Ive loved all of these products so much but especially these hand soaps i went ahead and ordered a couple of more once out guest left the home. Rated 5 out of 5 by litan from I received this product courtesy of Influenster and Love Beauty and Planet. I was pleasantly surprised at the size of the bottle of this hand wash. I love the way that this hand wash smells while not making my skin dry out (scents often dry out my sensitive skin). It is so moisturizing and it feels like I am pampering myself every time I wash my hands. It seems like a great bargain for how much you are getting of this high quality product. The fact that this company prides itself on being recycle friendly without sacrificing quality makes me confident enough to buy this product when I run out. Rated 4 out of 5 by ashleym419d from I received this product from Influenster with the understanding that I would leave a review in return. The first thing I noticed about this product was the color - it boasted to be natural and you could tell there was no added pigments! The second thing I noticed was the smell - it is very strong, very floral, and very sweet. It's not a bad thing but if strong scents give you headaches I would pass. I actually think the bottle is quite big, and a little goes a long way so it should last quite awhile (good value!). Now on to the performance - it lathers really well and leaves my hands feeling clean. It is not moisturizing but I don't feel like my hands are dry afterwards either. I liked this hand soap more than I thought I would, but the scent is not usually what I go for so I'm sure if I would buy it.